When the Yaris debuted in 2007, critics praised the little car for driving more like a competent sedan and less like an inexpensive, sub-compact car. The Yaris also boasted a comfortable interior, which felt more substantial than what the low price tag might have suggested, and featured an appealing exterior vastly different than the econoboxes currently on the road. But the big question was whether Americans would actually buy something that looked better suited to circling the Arc de Triomphe than a Westfield Center parking lot. Zip ahead two years and the Toyota Yaris is alive and kicking – boasting sales figures of over 102,000 sold in 2008. A good blend of Japanese Kei car and European hatch, it delivers on functionality – try to count all the storage spaces – and drivability, with a suspension taut enough to make the drive entertaining. Retaining the low MSRP of $12,205 meant trimming out many tech features and amenities that come standard on other cars, like power doors and folding rear seats, but being able to afford a new car might just make up for it. Like a Pixar film, this car’s looks appeal to everyone. Its rounded, oversized headlamps and bubble-shaped hatchback trim make it irresistible. Toyota recognizes that owners need room for their stuff, so cup holders and cubby spaces are plentiful and fit a variety of storage needs. Seat height can’t be adjusted and the steering wheel doesn’t have a telescoping function, both limiting the size of the driver who feels comfortable in the Yaris. As expected, the interior is filled with hard plastics. The rear seats aren’t made for long journeys. Here we have an example of a near-perfect city car. Transmission shifts aren’t intrusive and downshifts don’t lag nearly as much as you’d expect for a budget car. Its buzzy, small displacement engine provides just enough grunt to climb hills, though an eternity passes before the transmission downshifts for high speed passing. What doesn’t help the situation is a gas pedal as wide and durable as a whittled-down toothpick. Suspension is tuned just perfectly for city streets, where the Yaris won’t meet a bump it can’t soften, and the steering, while light, doesn’t feel as twitchy as some others out there. The compact only falters when it comes to cabin space itself, which feels too vertically compacted. 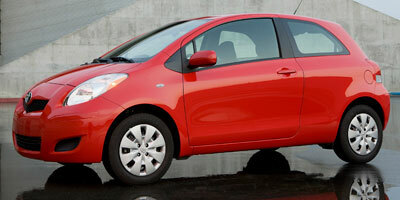 A low roof and high floor make it obvious that the Yaris was designed for physically smaller people. For a 2,300-pound car, a 1.5-liter four-cylinder engine with 106 horsepower and 103 lb-ft of torque could be considered quite robust, as long as you’re not planning on spinning it around an autocross track. The five-door hatchback gets a four-speed automatic transmission, but the three-door and sedan trims get a choice between that and a five-speed manual. While the budget price is great for some, a few more dollars can get you the convenience or power package. Depending on the model, the grouping includes audio upgrades like an auxiliary input jack and satellite radio capability, along with extras like folding rear seats, cruise control and power functions. The S comes with many of these features standard at the base price. Truth be told, the Yaris is far from what we would call ‘technologically advanced’. That’s sometimes not a bad thing, though, and its simplicity makes for a basic but cheap ride. We do like that Toyota hasn’t forgotten about those living in the Snow Belt. An all-weather guard package makes winter life a little easier with a heavy-duty heater and starter, rear heater duct and a rear window defroster. This little car sports some pretty big mileage numbers. It gets 29 mpg city and 35 mpg highway for those with automatic transmissions. For the manual transmission, highway numbers increase by one. Both sets of numbers blaze by Honda’s competitor, the Fit, but don’t hold a candle to the 33/41 mpg that the Smart ForTwo produces. The sparse interior contains just enough creature comforts to get by, though long journeys in the rear seats might make lifelong enemies out of your passengers. The instrument panel is centered in the middle of the dash, so the view of the road is quite undisturbed by dials and lights. The odd placement may take awhile to get used to though. Hard plastics fill every nook and cranny, and the only way to get the rear seats to fold down in the hatchback is to opt for a package. The tiny hatchback is only 12 ½ feet long, and the sedan trim isn’t exactly a goliath either, just 19 inches longer, albeit with less headroom all around. Each model has a distinct minicar feel to it – especially the hatchback – thanks to a rounded design and goggly-eyed headlamps. The S trim features a spoiler, fog lamps and S badging. Toyota has priced the Yaris well within its segment. The $12,205 three-door is the best bargain, but the $13,305 five-door hatchback and $12,965 sedan won’t exactly break the bank either. Upgrading to the S trim will set you back about $2,000 more for each model. Within the segment, contenders are the $14,750 Honda Fit, $11,990 Smart Pure, $9,990 Nissan Versa and $13,299 Suzuki SX4. We think the Yaris may be the most appealing car Toyota has given us in recent years. It’s the perfect minicar for city driving, but its talents also stretch to meet more diverse driving needs. It handles well, can park in the tightest of spots and has just enough options to keep buyers satisfied. Its base price won’t exactly break the bank either. If economic issues aren’t enough for you to hop into a smaller car, maybe the sheer enjoyment of driving such a diminutive car will persuade you.